this post could also be known as "post 03 and a half". these are old icons that i don't love and don't hate, so i guess they deserve to see the light of day. but that's pretty much it. i find them kinda blah. :/ there are also two wallpapers and one banner on this post (will add soon). i think you can skip this one. 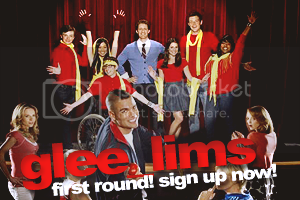 Round One on glee_lims! Click Here To Sign Up! Tags: & pimp, glee, i love you wonkie! i've been making icons for years and there are some icons from the past that i still kinda like. here are my favorites. it doesn't look like a batch; it's not one. it's just a bunch of icons that i wanted to share because they mean something to me and are not embarassing. some were posted at revolutionkid, some were made for icontests (i even won some prizes! :D). sign up here! sign up here! why, hello! it's been a year since i last posted here. it's a long time without an update, but i just wasn't in the mood. i'm back now. 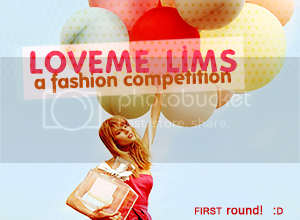 my dearest wonkiebonky and i made an icon battle to promote our very badass lims contest. the community focus on fashion images and so does our battle. i think it's brilliant! she is posting the same battle at her community, revolutionkid. i hope everyone likes it! (: and join our lims! because it is fun! i made these to round 10 of celeb20in20. it's the first time i partipate and i was so insecure about the 20 icons i should deliver that i made about 50 of them - i may post my favorites later. my celebrity of choice for this round is kirsten dunst. 46 icons daniel radcliffe, everything is illuminated, fashion, gossip girl, kate bosworth, kirsten dunst, lula magazine, misc, scarlett johansson, the o.c., the virgin suicides. this community is under construction. (: thank you, refutare, for such a lovely layout.